CAIRO (AP) — In the judiciary's latest face-off with Egypt's Islamist rulers, the country's top council of judges decided Wednesday to suspend its participation in a government-backed judicial reform conference following a renewed push by lawmakers on a controversial bill that would force thousands of their colleagues into retirement. The declaration by the Supreme Judicial Council makes it unlikely that the conference, which aimed to give judges a chance to reform themselves, would reduce tensions between Islamist President Mohammed Morsi and his allies and the judiciary. Morsi's allies say Egypt's judiciary is filled with supporters of ousted president Hosni Mubarak, who have worked to undermine the transition to democracy and the Islamists' rise to power. Many judges agree in principle on the need for reform, but don't want the presidency or the legislature to carry it out. They say Morsi has tried to interfere in their affairs and curb their independence, with an eye to control them. Uproar erupted last month over the bill, the most controversial clause of which would drop retirement age for judges from 70 to 60. This would affect nearly a quarter of the country's 13,000 judges and prosecution officials, most of them in senior positions, including in Egypt's Supreme Constitutional Court. In an outreach to judges, Morsi agreed to a "Justice Conference" in which judges would front proposals to reform themselves. For a month there was no talk of the bill that included the retirement clause. But when parliament met on Tuesday and set May 25 as a date to begin debate, anger rekindled. The Supreme Judicial Council said in a statement published by the state news agency MENA that it was backing out of the conference, and in an even stronger rebuff, the nation's highest court said it "rejects the conference" and called on the Council to write off the idea altogether. The Cassation Court said following an emergency meeting that it would consult with other courts to discuss "violations" against the judiciary. The decisions were published by MENA. There was no immediate comment from Morsi's office. 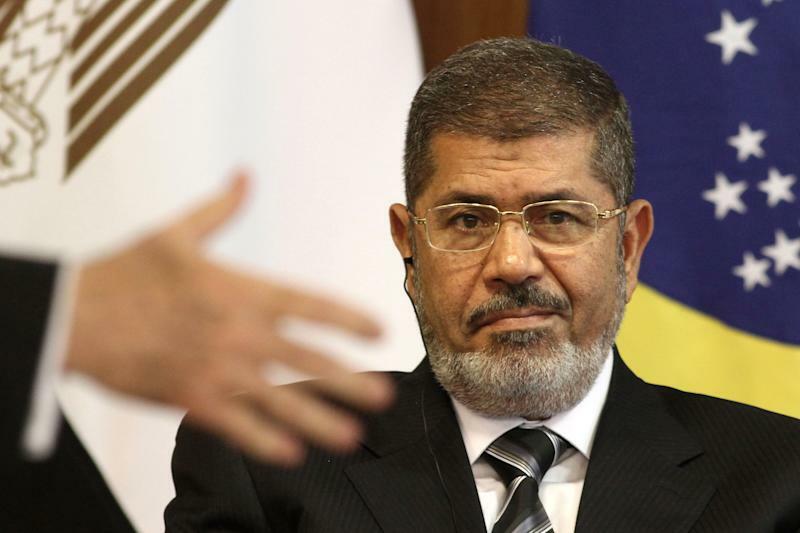 But Islamist lawmakers urged Morsi to go ahead with the conference without the judges. The judiciary has become a key battleground between Islamists and the largely secular opposition. It is the sole branch of government not dominated by Morsi's Islamist allies, although he does have some backers among the judges. A protest by opponents and supporters of the bill turned into violent street clashes in April. The latest showdown comes just weeks before the Supreme Constitutional Court is to rule on a legal challenge against the upper house of parliament, the Islamist-dominated Shura Council. Courts have dealt Islamists several setbacks in the past two years. One ruling dissolved the parliament's Islamist-dominated lower house last year, saying the law governing its election was invalid. Another forced a delay in elections for a new parliament when it ruled that the election law had to be reviewed by the Supreme Constitutional Court. Morsi himself clashed frequently with the judiciary since becoming president last summer, at one point issuing a decree, since rescinded, that his decisions were immune to judicial review. Morsi's backers accuse his opponents, including some judges, of stirring up unrest to undermine his rule. The president's critics say that Morsi, who was elected with 51.7 percent of the vote, has failed to live up to his promises of being inclusive and ignored the goals of the 2011 uprising against Mubarak. Senior judge Ashraf Nada, who presides over Cairo's appeals court, said that the law discussed in parliament threatens to "destroy" the Egyptian judiciary because it would send thousands of senior, well trained judges into retirement, without a way of replacing them. He told The Associated Press the new drive to push the law into the Shura Council was a tactic to pressure the SCC ahead of the decision on the body's constitutionality next month. Nada said Morsi should not have promised to resolve the issue if he was not able to deliver. Judges say the lawmakers are violating the country's new constitution, which requires that the judiciary be consulted on any laws pertaining to their profession before taking it to the legislature. In an emergency session last month, the powerful Judges Club, the main organization representing Egypt's 13,000 judges, said the law is trampling on their rights and vowed to complain to international organizations against violations against the judiciary. Essam Sultan, a leading member of the Islamist al-Wasat party that introduced the proposed law, said the conference should still go ahead without the judges and with "representatives of the people." He wrote on his Facebook page Wednesday that the judges are not above scrutiny. "It is a mistake for some judges to think that they alone are interested in conferences and draft bills that relate to matters of justice, and that the people don't exist," Sultan wrote. "The solution is with the people." Also Wednesday, Egyptian state prosecutors said three suspected al-Qaida-linked militants detained over the weekend were plotting to attack the U.S. and French embassies in Cairo using car bombs, MENA reported. Officials said when they announced the arrests Saturday that the men had been in contact with Dawood al-Assady, a leader of al-Qaida in southeast Asian countries, and that the group was planning suicide attacks on government buildings and a foreign embassy. The interior minister denied that al-Qaida is active in Egypt, but said the three men were in contact with al-Qaida militants abroad. Egypt's security has sharply deteriorated in the past two years, with Islamist militants suspected of being behind cross-border assaults on Israel as well as a bold attack that killed 16 Egyptian soldiers in the northern Sinai Peninsula last year. In a separate development, MENA said a Cairo prosecutor ordered that the daughter of a prominent opposition leader be detained for four days on allegations of fraud and money laundering. Salma Sabahi is the daughter of Hamdeen Sabahi, who came in third in Egypt's first presidential elections last year. A lawyer for her could be reached for comment. Another 33 people were referred to court for trial for their alleged role in instigating clashes in the Nile Delta town of Khosos and Cairo that left six Christians and one Muslim dead last month. The incidents were the country's deadliest sectarian violence since Morsi came to office in June.